SALISBURY, Md. – The No. 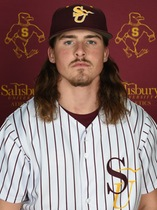 15 Salisbury University baseball team opened a three-game weekend series against York College of Pennsylvania on Friday afternoon, and came away with the victory over the Spartans, 15-8. Salisbury (22-6-1, 11-2 CAC) got off to a bit of a rocky start, allowing three runs to score in the top of the first inning on two home runs. The Sea Gulls answered back in the bottom half of the inning, however, scoring two runs on a Brad Haas single down the left field line to make it 3-2. York (17-6, 9-3 CAC) ran into trouble again in the second inning, allowing the first three Sea Gulls to reach base before Cameron Hyder delivered with a bases-clearing triple down the right field line. The maroon and gold added three more runs before the Spartans could close the inning to take the lead at 8-3. After York added a pair of runs in the top of the fourth inning, Justin Meekins answered back by opening the bottom half of the inning with a solo bomb over the right field fence. Salisbury continued to add to its lead with four more runs in the fifth inning, including a Jimmy Adkins (Delmar) RBI double and a Jay Perry RBI single, to open the lead to 13-5. Following another run-scoring single by Perry in the sixth inning, the Spartans launched a pair of home runs in the top of the seventh inning to score three more and cut the deficit to 14-8. The final run of the afternoon would go to the Sea Gulls, however, as a Haas sacrifice fly in the bottom of the seventh inning scored Trent Saunders from third base. Clayton Dwyer (6-2) earned the victory, tossing eight full innings and striking out six batters in the process. Dwyer allowed eight runs to score, six of which were earned. The team returns to action on Saturday, April 13 to wrap up the weekend series with doubleheader action beginning at 12 p.m.